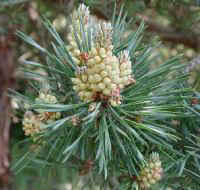 (Austrian Pine (Pinus nigra) - 02) The Austrian pine in spring bloom. 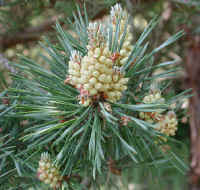 The dark green double needle clusters of the Austrian pine can grow as long as 6-1/2 inches. A full grown tree can reach a height of 90 feet. 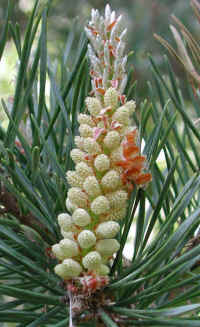 (Austrian Pine (Pinus nigra) - 01)In this enlarged photo the new growth needles can be seen emerging on top of the bloom. At the bottom of the bloom, pine gum is dripping. This enlargement also shows the ridges in the needles.